Consumers along the Chicago's North Shore would end up paying about $45 million more a year for healthcare if two of the biggest Chicago-area hospital networks merged, an expert for federal antitrust regulators testified Wednesday. That's based on Advocate Health Care and NorthShore University HealthSystem gaining better bargaining power at the negotiating table with insurers if they combined and created a 16-hospital system, the largest in Illinois and among the biggest in the nation. Together, the systems would be able to hike prices on average 8% a year through higher reimbursement rates from insurers, which likely would pass that increase along to consumers by raising premiums or co-pays, said Steven Tenn, a former economist at the Federal Trade Commission who testified as an expert witness for the antitrust regulators. The price hike was projected for NorthShore's four hospitals and two of Advocate's 12 hospitals that are in or near the northern suburbs, the area the FTC said the merged system would dominate with a 55% market share. Bottom line, the marriage would lead to a “significant price increase that will harm patients” in the Chicago area,” Tenn said. The FTC blocked their proposed marriage in December, saying together they would control more than half of the inpatient hospital services on the North Shore and likely result in “significant harm” to consumers through higher prices and fewer incentives to boost quality. The health systems have pushed back, saying the FTC didn't include enough hospitals when it defined the North Shore market, notably powerhouse and NorthShore rival Northwestern Memorial Hospital. It's become a pivotal part of the trial. To quell concerns about price hikes, the systems have offered to create a health insurance plan that would cost 10% less than the lowest comparably priced product available. On Wednesday, FTC attorney Tom Greene highlighted on maps how much market share Advocate and NorthShore facilities in the northern suburbs have separately, then combined. 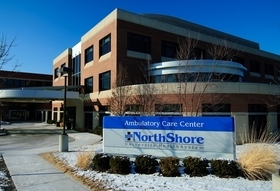 In each of the markets around the NorthShore hospitals in Evanston, Skokie, Highland Park and Glenview, patients now either most frequently visit those hospitals or Advocate facilities in Park Ridge or Libertyville, followed by other competitors like Northwest Community Hospital in northwest suburban Arlington Heights or Swedish Covenant Hospital on Chicago's North Side. To quell concerns about rising costs, Advocate CEO Jim Skogsbergh testified that no health system in the Chicago area can raise prices because of the power of Blue Cross & Blue Shield of Illinois, the dominant insurer in the state that controls at least 70% of the market. “The ability for us to raise prices is virtually nil,” Skogsbergh said. Advocate fixed the southwest issue by affiliating with Silver Cross Hospital in New Lenox, but it still had a gap east of Interstate 94 along on the lake. It's trying to partner up with NorthShore to address that void. Skogsbergh added that Advocate talked about partnering with other providers, including Streeterville-based Northwestern, a powerhouse academic medical center, but that deal didn't work out because of disagreements over how they should get reimbursed by insurers for the care they provide. Northwestern spokesman Chris King said any discussions the system had with others in the past are confidential. The trial is expected to wrap up next week. "FTC expert warns of $45 million cost increase in merger trial" originally appeared on the website of Crain's Chicago Business.